On February 15th, 2018 Cinemagic, hosted by International television celebrity, Ross King, held their annual event at the Fairmount Miramar Hotel. The program featured the trailer to their new feature film, Grace and Goliath and a short film written by screenwriter Marie Campbell made in Northern Ireland by young filmmakers from Northern Ireland and Los Angeles. The audience was also treated to an inspiring musical performance of “Man In The Mirror” by the young people who had participated in the program throughout the year. Cinemagic is an award winning charity and the largest film and television festival designed for and by young people in the UK and Ireland. They take youth from diverse backgrounds, from LA’s Hamilton High School, Jordan School in Watts, and Santa Monica’s New Road School to participate with similar communities in Northern Ireland to educate them in the magic of film, television, digital technologies and music. The goal is to inspire young people through film screenings, industry workshops, practical masterclasses, film making projects and outreach activities. This organization first started working with young people in 1989. To date Cinemagic has engaged with over 500,000 young people, screened over 3000 films, and hosted over 500 masterclasses, workshops and special events. Their film production projects have received international acclaim for their ambition, quality and reach. Cinemagic breaks down boundaries, promotes inclusion, and introduces young people to other cultures, languages and traditions. Their young trainees have gone on to work with various film and television companies such as the BBC, HBO, Disney, Sky Atlantic, RTE, and Bedlam Productions. They have firmly established annual Cinemagic Film and Television Festivals in Belfast, Dublin, London, Paris, Los Angeles and New York, with over 40,000 young people participating in events each year. In the last four years Cinemagic has produced two feature films; secured worldwide distribution for their first feature film A Christmas Star; developed two “behind the scenes” award-winning documentaries, produced over 45 short films; supported over 150 young trainees to work in the film and television industry; and they are now having the world premiere of the feature film, Grace and Goliath in Beverly Hills. Jennifer Morrison, former star of the hit television series, Once Upon A Time concisely summed up why Cinemagic plays a critical role for these young people who are interested in the Entertainment Industry. 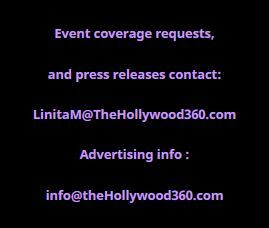 The Hollywood 360 would like to thank Christine Peake, Peakprgroup, for inviting us to this wonderful event.